On Monday, the committee substitute for House Bill 2860, was up for a public hearing in the Texas House Committee on State Affairs. We delivered testimony in support of the bill, while also asking for a significant change. You can send and email to support these recommendations. This bill would set standards that residential and small commercial customers in many parts of Texas can rely on when considering the use of distributed generation. A growing number of Texas residents and businesses are utilizing distributed solar energy systems to reduce their electric bills. This is improving affordability for residents, reducing operating costs for businesses, and creating local jobs. There are now over 14,000 Texas residents and businesses using distributed solar energy. And over 9,600 people are employed in the solar industry in Texas. All of this is good news and the average solar customer has a positive experience and is happy to be paying less for electricity while doing something reduce air pollution, improve public health and address climate change. But, the lack of statewide standards has led to frustration and bad practices in some cases. This bill would start the process of standardizing what should be included in a solar lease, where and how customers have a right to utilize distributed solar energy, and how electric utilities should treat customers who use or wish to use solar. Section 6 of this bill would add Section 39.1015(a) to the Utilities Code to define “distributed generation.” It expands the definition of “distributed renewable generation” found in Section 39.916(a)(1) of the Utilities Code, to all energy sources. 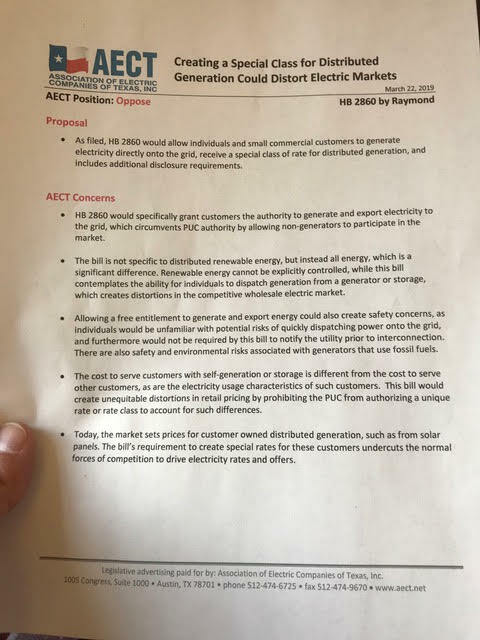 This expanded term is referenced throughout this bill and would limit the ability of HOAs, municipalities and electric utilities from regulating the use of fossil fuel generators if they were connected behind the meter. While it is unlikely that many residential or small commercial customers would utilize such generators because of the relatively high cost, we don’t think this is a wise change. As the Association of Electric Companies of Texas (AECT) pointed out in its letter to the House Committee on State Affairs, there are “safety and environmental risks associated with generators that use fossil fuel.” This is the one statement in that letter that we agree with. Fossil fuel generators, are noisy, polluting, often include exposed elements that get very hot and include moving parts. These are not characteristics that many would welcome into their residential or mixed-use neighborhoods. This problem can be remedied by simply using the definition of “distributed renewable generation” everywhere that you currently find the new definition of “distributed generation” referenced. The remainder of this testimony is written assuming this change was made. Solar leases are a common tool that can allow certain customers to access distributed solar energy systems that may not otherwise be able to do so. They are especially helpful for nonprofits and other customers who don’t have tax liability, as a way to access the benefits of the federal solar investment tax credit. They are also attractive for customers who don’t want to be responsible for maintenance. While they can be beneficial, they are also often quite complicated and customers can sometimes find themselves trapped in a bad agreement that wasn’t what they expected. Every industry has its good actors and bad actors and the solar industry is the same. Most companies that offer solar leases already comply with the provisions proposed in Section 1 of this bill. This short list of requirements will simply establish a standard that all companies offering solar leases must abide by, in order to protect the customer. In addition to information about equipment, costs, maintenance and warranties, terms regarding the transfer of the lease to a future property owner would need to be clearly stated in writing. In most Texas towns and cities, residents and business are able to install distributed solar energy systems on their property. As with any electrical work a permit and inspection may be required. That represents a fair and smart balance between allowing property owners to benefit from this valuable resource and protecting the city and other residents and businesses from harm. 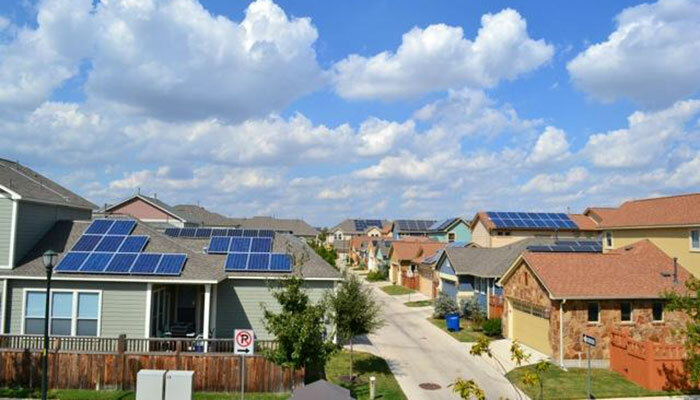 In the past, some homeowners associations would ban or severely restrict distributed solar installations, but the Texas Legislature acted in 2011 and 2015 to set standards for how HOAs can and cannot regulate the use of solar energy systems. Section 4 of this bill would clarify the allowable inspection and interconnection process that an HOA can impose on a property owner. Section 2 would apply some of the same standards set for HOAs to municipalities. Section 6 of this bill would set minimum standards for how investor owned utilities should treat customers wishing to utilize distributed generation and energy storage. Numerous studies have shown that distributed solar energy provides greater financial benefit than is accounted for even through full net metering. Texas is one of only 5 states that have no net metering requirement and this bill would not change that. It would only prohibit investor owned utilities from unfairly punishing customers who wish to use solar and or energy storage at their homes and businesses. Utilities would be required to provide timely interconnection of distributed generation and would not be allowed to charge customers punitive rates simply because they chose to utilize distributed generation or energy storage. We encourage Texas House Committee on State Affairs to amend CSHB 2860 to utilize the existing definition of “distributed renewable generation” and then pass it out of committee. You can email the committee to support this recommendation.